Is calm transition possible after Turkey's referendum? With a thin win in major cities and allegations of voter fraud and illegal maneuvering, how long can Turkish President Recep Tayyip Erdogan stifle a budding movement resisting the referendum outcome? Turkish President Recep Tayyip Erdogan arrives at a news conference in Istanbul, Turkey, April 16, 2017. ISTANBUL — During the night of April 15 until dawn the next day, the city did not sleep much. Sitting on the terrace of a Karakoy commercial district high-rise, my friends and I could see lights on all night in most of the neighborhood. On social media, hundreds of people complained about being sleepless and anxious as the referendum on constitutional changes approached. When the call for morning prayer began around dawn, my first phone call came from friends in Sirnak, a war-torn city in southeast Turkey close to the Iraqi border. Its pro-Kurdish local government had been replaced months earlier by the Justice and Development Party (AKP). Local election observers had been removed under the emergency law, accused of supporting terrorism. My friend in Sirnak, where voting started an hour earlier than in Istanbul, was cheerful as she said, “We are ready to dance in the streets in the evening. Sirnak will say no.” Indeed, Sirnak and several Kurdish cities, despite government pressure, overwhelmingly voted against the proposed changes that would greatly expand the presidency's power. The sleepless pre-referendum night was met with a busy and tense day of commotion all around the country. I visited several Istanbul neighborhoods, spoke with diverse groups throughout the day and witnessed the tensions and violence firsthand. Amendment opponents in major cities were well-organized, but they could not be everywhere. In small towns and villages, several lawmakers and activists reported local leaders (mukhtars) were illegally forcing people to display their votes publicly. Indeed, as voting was coming to a close in the afternoon, it became clear that despite a law against it, people had been allowed to bring their cellphones into the voting areas: There were hundreds of selfies on social media platforms from AKP supporters showing them proudly smiling with "yes" ballots. However, these individual incidents were not the only major problem with regard to voter fraud. There were also photos and videos of people carrying bags of ballots from cars into the voting areas, stamping "yes" on them and closing the votes with the official seal. As these videos of AKP men joking about who was the best at stamping "yes" on ballots started spreading on social media, I visited an underground mosque in Fatih for noon prayers. The congregation of 50 men was friendly to an outsider and nervous about the referendum. Most of them said they did not think Istanbul would be carried by a "yes" vote. One man suggested I visit "the jihadi bookstore" next door. "They support the referendum; we support Erdogan but not the referendum.” At the bookstore, the owner said, “We believe Erdogan deserves a stronger position in the country. Right now, every time he wants to help us [Syrians], we hit more roadblocks. If he wins, we are ready to support him more.” Indeed, after Erdogan’s victory speech in the evening, these groups posted several congratulatory messages. Multiple cases of intimidation were also reported. Fellow Al-Monitor contributor Ali Bayramoglu was brutally attacked for voting "no" in Istanbul. Around 5 p.m., right before the polls closed, the Supreme Election Council announced it had made a change in its official rules and would allow votes with no official seal to be counted. Originally, these votes were discarded as invalid. As observers at voting booths were trying to figure out the decision of the council, police units started arriving at several voting areas asking the observers to leave. According to the official rules, while people are asked to vote in secret, ballot counting once the polls close is open to the public. As vote observers were still waiting to turn over ballots to the official bodies, and within only two hours of the polls closing, several pro-AKP media outlets started announcing the amendments had been approved. Some even showed the "yes" vote above 60%. The state-run Anadolu Agency was the only news media allowed to announce the outcome, and its results did not match the Supreme Election Council’s website. At that time, Meral Aksener, an ultranationalist politician, called a TV channel to say only 75-80% of the ballots had been counted and the results were showing a victory for naysayers at 52%. At that point, I was at a conservative restaurant in Tophane that displayed a Turkish flag with Erdogan’s photo on its wall. The patrons were confident the "yes" vote would win. One said, “Erdogan is the leader; do you think he will ever hold an election he will lose? Does [Russian President Vladimir] Putin ever lose? Does [Syrian President Bashar al-] Assad ever lose an election?” When I asked them if life would be better if Erdogan won, they said that is their prayer because they face financial difficulties. There was no jubilant celebration in the neighborhood. The public tension did not die down after the supposed victory. Several patrons at a cafe in the liberal Cihangir area were asking if women would now become the concubines of AKP men. 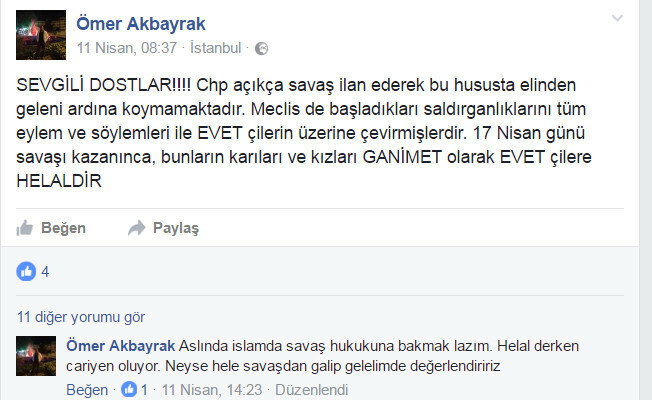 On April 11, a worker from Istanbul City Municipality (IBB), Omer Akbayrak, posted on his Facebook account, “On April 17, after we win the war, their [naysayers’] wives and daughters" will be fair game for those who voted "yes." The AKP-controlled IBB immediately fired Akbayrak, yet several others started posting photos of female relatives — wives, daughters, mothers and granddaughters — of opposition leaders, prominent naysayer journalists and actors, saying, "On April 17, they will be our concubines." Even as different members of the "no" camp tried to convince the media that the count wasn't over yet, first the prime minister, then Erdogan, gave victory speeches. Erdogan warned his supporters that people might try to belittle their victory but that it wouldn't matter. Anadolu Agency’s unofficial results show 51.4% for the "yes" vote, about 1.2 million more than the "no" vote. However, opposition parties urge a recount for 60% of the ballots, claiming fraudulent voting and the voting council's last-minute, possibly illegal changing of its rules at the AKP’s request. The legitimacy of the results remains highly contested. "No" votes prevailed in Istanbul, Ankara, Izmir and several other major cities, along with Kurdish-majority areas. As Erdogan was speaking, hundreds of people spontaneously started banging pots and pans in Beyoglu district. On the social media site Periscope, recordings of protesters marching in several cities were shared all night. Overall, as an observer for 30 years, I can say this referendum was a bad idea — everyone in Turkey lost except for the lucky few in Erdogan’s top circle, at least for the short term. Now the question is: How will Turkey, in its precarious position, shift to the presidential system?